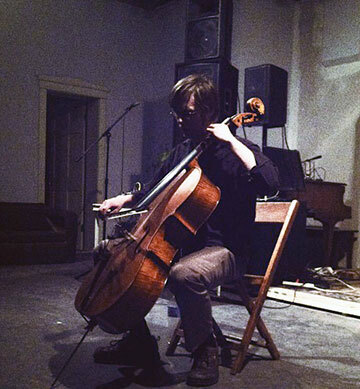 Buffalo, New York experimental cellist and composer T.J. Borden will be appearing tonight at Boheme Collectif as a part of a fantastic bill organized by Future Night’s Mike Kluge. T.J. performed last year at Noa Noa and also on this Theatre Intangible episode. T.J. is a big proponent of improvisation and extended technique, utilizing every inch of his cello. If you dig string players like Peter Kowald and Thomas Helton, you’ll really love T.J. He’s worked with artists such as Tony Conrad, Steven Mackey, Jack Wright, Evan Lipson, and DJ Spooky. Check out the below video for his duet with Thomas Helton. Visuals will be provided by the overhead projections of Dig Deep Light Show, who blew minds at Noa Noa last month with their light-led improv. Also on the bill, another extended-techniquer: guitarist Brady Sharp (who has appeared on all these T.I. episodes). One of the busiest drummers in Nashville, Tommy Stangroom will be performing a solo experimental set as Posttaste. He’s appeared on these T.I. episodes. Nashville rock n’ roll frontman T. Rust will collaborate with artist Brains Bailey on drones and projections. This show is going to be amazing! More info on the Facebook event page. You should be able to catch Antonio das Mortes at Third Man Light & Sound Machine at 7pm and still be able to see most or all of this show. Hope to see you there!